I have raved about the benefits of consuming codonopsis earlier in my Chicken Soup with Wolfberries & Red Dates Recipe post. 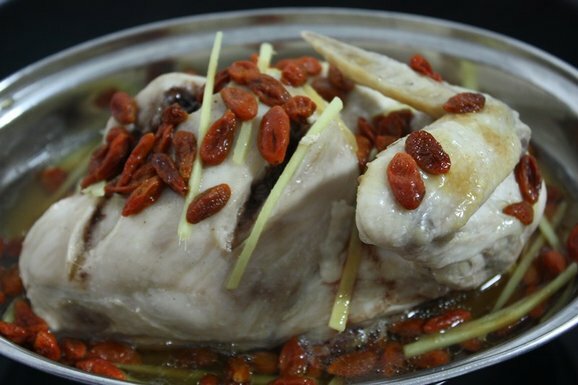 This is another similar recipe except that the chicken is steamed instead of being cooked in a soup. An easy to prepare, nutritious meal for the family! 1. Gently rub salt over the chicken and transfer to a steaming dish. Arrange the codonopsis and goji over the chicken. 2. Mix water, wine, light soy sauce and sugar in a bowl and drizzle sauce over the chicken. 3. Steam at high heat for about 20 minutes or till chicken is thoroughly cooked. 4. Once the chicken is done, remove the codonopsis roots and serve hot. The reason why the codonopsis roots shouldn’t remain in the dish when the chicken is ready is to prevent them from leaving a bitter after-taste to the steaming liquid. Anyway, they can’t be eaten too. A pinch of sugar is used to enhance the sweetness of the chicken and remove any traces of herby flavour which is already mild but some people may not be used to it. Serve the chicken hot with steamed rice. Enjoy!